Health and social care software platform provider Radar Healthcare has been developed to help organisations meet and manage regulatory requirements so they can provide the best possible care. 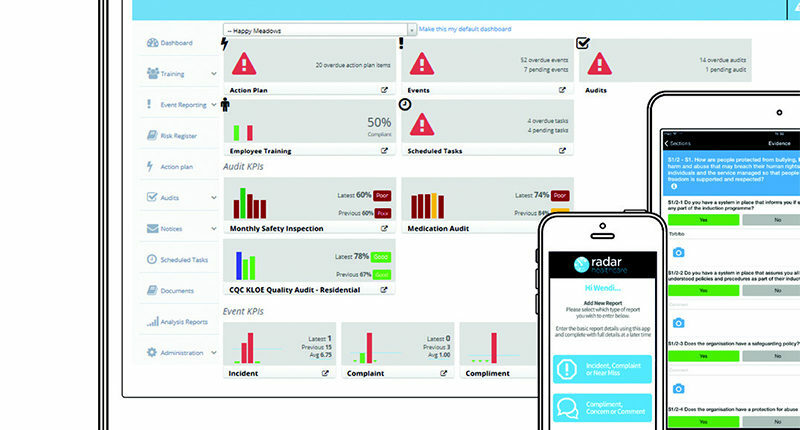 Radar aims to help social care providers address common failings in the induction and training of staff; the management of incidents and risks; governance and corporate oversight; standardising levels of care; policy management; improvement plans and quality improvement; and self-regulation and auditing. Care providers face operational challenges, commercial constraints and complex regulatory demands. The impacts on organisations from common failings can be significant. The CQC has called upon care providers to embrace technology for the benefit of service users, themselves and the sector as a whole. A systems based approach can bring about wide ranging benefits to your organisation and associated services. Radar Healthcare offers an effective and simple way to meet these challenges through its intuitive and user-friendly technology, delivering performance visibility and improved quality and compliance outcomes for your business. Are you interested in finding out how Radar can transform your services and help you become an Outstanding Care provider? We can help you.